The following profile was compiled by the Qikiqtani Inuit Association in Iqaluit, Nunavut in partnership with the Nunavut Roundtable for Poverty Reduction as well as Deatra Walsh and her team at Department of Family Services, Government of Nunavut. Meet Johnny and Elisapie Naullaq and their four children: Jayko, 12; Lucassie, 10, Nurlu, 7, and Kulu, 3. Kulu has been living with them for two years; she was adopted when her biological mother, Elisapie’s sister, died by suicide. Elisapie’s mother, Inuusiq Nakasuk, lives with them. The family lives in Nunavut’s capital, Iqaluit. They live in a small government-subsidized 3-bedroom quadriplex and have been on a waiting list for a larger unit for 7 years. Together, this family represents many in Iqaluit facing multiple barriers including food security and adequate housing. Elisapie has good, steady employment as the Employee Relations Coordinator for the Department of Finance for the Government of Nunavut. Her annual salary is $81,861, plus an annual Northern Allowance of $15,016. Johnny did not graduate high school and is a full-time hunter, but he does not go out often because his snowmobile needs repairs. Inuusiq receives a pension every month which helps with expenses. This family does comparatively well, but as a family living on one salary, they still live paycheque-to-paycheque and are unable to save up to buy a house. Johnny’s half-brother, Joe, has come over from Kimmirut and has been living with the family for 8 months in the hopes of finding work in the capital. He sleeps on the couch (and eats their food) but he usually goes to the community kitchen for lunch. Johnny and Joe make and sell small soapstone carvings and jewelry to offset the high costs of living, particularly in the tougher winter months, but this does not provide consistent income. 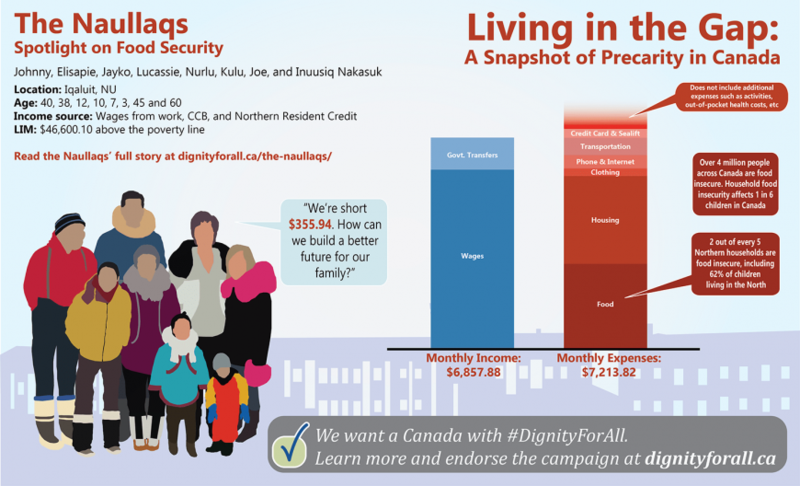 Just like many Nunavut residents, this family struggles financially, despite having a good paying job and supplemental income. Often, this family experiences a significant gap between their monthly income and expenses. Their credit line is almost maxed out, and they hope to be able to extend it based on Elisapie’s salary. Like nearly 70% of families in Nunavut, they struggle with accessing affordable, nutritious food. Sometimes, the kids rely on their school’s snack program for breakfast because there is just no more food in the house. Elisapie and Johnny cook at home most of the time and include country food into their meals as often as possible. Despite their shortfall, this family is doing very well in Nunavut, where so often good jobs are hard to come by. In addition, many people in Nunavut struggle with addictions, unemployment, precarity, and overcrowding. In this home, there are 3 bedrooms for 8 people; all the kids sleep in the same room, grandma has her own room, Kulu sleeps with Elisapie and Johnny and Joe sleep on the couch. Elisapie and Johnny had applied for a mortgage to buy a 5-bedroom house but were denied because they did not have a down payment. The tiny single-family home they applied for was a modest 1200sq feet with 5 bedrooms. It needed repair but at a cost of $450,000, was a great deal in Iqaluit. $46,600.10 above the poverty line (annual after-tax low-income measure). Over 4 million people across Canada are food insecure. Household food insecurity affects 1 in 6 children in Canada. Food-insecure individuals are at greater risk for developing new health issues and have a harder time managing existing chronic health problems. Children suffer greater risks for conditions like asthma, depression, and suicidal ideation in adolescence and early adulthood. Food bank usage across Canada was 3% higher in 2016 than the year before, and 28% higher than it was in 2008. 2 out of every 5 Northern households are food insecure, including 62% of children living in the North . Inuit Nunangat (Inuit regions of Canada) has seen a 50% increase in overcrowded housing over the last 15 years. In some communities, 72% of social housing tenants live in overcrowded housing conditions; 38% of all social housing tenants in Nunavut live in overcrowded conditions. Nunavut has a suicide rate that is 10 times the national average. In a country as rich as ours, it is unacceptable that 1 in 8 households still struggle to put food on the table. We urge you to add your voice to the over 12,000 individuals, organizations, and government representatives who support Dignity for All’s call for a comprehensive, rights-based anti-poverty plan by signing-on to the campaign. Citizens, organizations, and governments: together, we can work towards making that vision a reality. Check out Dignity for All’s one-pager on Food Security for more information.